Joy Creek Photo Archive (c) all rights reserved Clematis 'Francesca' was hybridized by our friend Malcolm Oviatt-ham and named for his daughter. In our garden, it clambers up a trellis spilling its bounty of flowers down on the emerging flowers of Hydrangea 'Annabelle'. The bell-like flowers do have some interior staminodes but not densely so. It reliably repeats its bloom during the summer. All of our Clematis are two year old plants that are suitable for immediate planting in your garden. April and May; summer repeat. 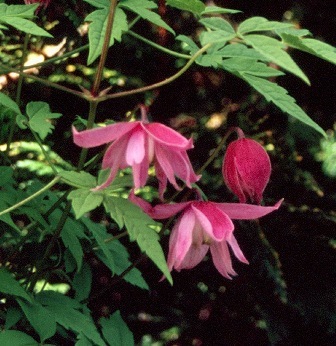 9-12 ft.
Vines from Clematis Section Atragene have lantern-shaped flowers. Their silky seed heads are attractive throughout the season. These bloom on old wood. Prune or tidy up after bloom or cut back hard soon after bloom to revitalize.